The heartwarming true story of a blind horse named Joey. At the height of his show career, this beautiful Appaloosa’s majestic stature, strength, and willingness to work made him the perfect partner. But when an injury cost Joey his show career, he moved from one owner to the next, ultimately experiencing severe abuse and neglect. A rescue group found Joey nearly dead from starvation—and blind. Then he came to Hope Reins—a ranch dedicated to helping hurting kids who had been abused, emotionally wounded, or unwanted. By teaching these children to care for rescued animals, the Hope Reins staff were convinced they could reach kids with love and hope and show them that we are never forgotten by God. But could the financially struggling ranch afford to take care of a blind horse that no one else wanted? Could Joey somehow learn to trust people even though the world had hurt him so badly? And what would happen—to Joey, the kids, and Hope Reins—if they failed? A true story of friendship destined to become a classic, Joey will touch your heart and reveal the power of finding light in the darkness. This is an amazing book. Bleakley is a skilled writer and I felt like I was right in the paddock with the horses and the volunteer trainers. I felt the frustration of the volunteers, trying to help heal and then train the severely damaged horses. I felt the grief they experienced when a horse was lost. I sensed the wonder they experienced when an autistic child responded to the nuzzle of a horse. I had no idea horses could sense so much, especially when a person is hurting or in another way in need of a nuzzle. Kim, strengthened by God and with the help of so many volunteers, has created a wonderful ministry of equine therapy. I was moved to see how a child responded to a horse when he had spurned human interaction. It was heartening to see how humans and horses healed together. This book is full of heartwarming stories and a few that will bring tears to your eyes. I highly recommend it. You can watch the book trailer here. You can find the ranch website here. audiences about his extraordinary grace at work in our ordinary lives. One October evening I stared into the eyes of the most unusual looking horse I had ever seen—his black and white spotted coat resembled that of a Dalmatian; his soft pink lips were chewing at some invisible morsel; and his charcoal eyes seemed to peer into my very soul. And although I’m not what anyone would describe as a horse person, I was completely captivated by this horse. I inched closer to him, compelled forward by some unseen force, until only a thin rail separated us. He stared at me. I smiled. Can a horse register a human smile? I had no idea, but I smiled anyway. The founder of the horse ranch was telling our small group about the ministry she had started—a ministry that pairs rescued horses with hurting children to help them find true hope and real healing. I listened to her words, but my eyes never moved from the horse. He looked at me as if he could read my every thought. As if he knew exactly why I was at the ranch that night. That I had been feeling a bit lost, struggling to find myself—my calling—in the midst of a new season of life. That I was on this tour in the hopes that I might find answers here—maybe even a purpose. He bent his head toward the railing just inches from my resting hand. His eyes now level with my own, the setting sun reflecting brilliant hues in the depths of his eyes. How beautiful, I whispered as my fingers reached toward him. “And our Joey here is completely blind…” I heard the woman say. “He was a former champion…injured…sold…abused…abandoned…. The fragmented sentence floated around the picturesque scene, but the words just didn’t make sense. Surely the woman wasn’t talking about this horse? Not the one who could see into my soul. Not the black and white beauty who knew all my secrets with just one look? The woman handed Joey a carrot. His greedy lips taking the treat from her hand, leaving it free to scratch him behind the ear. “But Joey was rescued and now he lives here,” she continued, “Where every day his determination and blind faith, point hurting kids to hope. Kids who have also known abuse and abandonment. Kids who see Joey choosing to live, choosing to learn, choosing to trust, and realize that maybe, just maybe they can too.” Tears flowed down my face as I watched the horse nuzzle the woman’s hand. A blind horse leading people to see hope. The phrase swirled around my mind, before settling in my heart. I had gone to the ranch that day looking for a purpose. Thinking that I could volunteer—use my long forgotten counseling degree in some way. Thinking that time spent here would ease the transition from full-time mommy to mother of school-age children. However, days after meeting the horse his eyes still haunted me. His story still captivated me. And so in spite of knowing very little about horses, and having never attempted anything like writing a book before, I sat down to write about a horse named Joey. A blind horse who was helping me find my way home…. I enjoyed this police procedure mystery taking place in Memphis. It contains a good combination of a current homicide investigation and an unsolved homicide from years ago. The novel also has a good balance of character development and plot movement. The two people investigating the murder, Rachel and Boone, had previously dated but she had broken off the relationship. She is convinced a romance would not work, especially since they work in the same police department. But feelings are still there, for both of them. That this novel takes place in Memphis is fun. The man recently murdered was an Elvis tribute artist. We learn quite a bit about the events taking place in the city related to the famous man. We find out that the unsolved murder of Rachel's mother, years ago, may be related to what is happening now. Trying to figure out who the murderer is turned out to be a good quest. We know it is someone in the current life of Rachel. There are several suspects and a few red herrings to keep us guessing. I do recommend this novel to readers who like a good balance of character involvement and ongoing police investigation. The suspense is little until the end. You can watch a short book trailer here. This is the third novel is a series. You can read my reviews of the previous novels: Justice Delayed and Justice Buried. Patricia Bradley is the author of several novels. She was a finalist for the Genesis Award, winner of a Daphne du Maurier Award, and winner of a Touched By Love Award. She is co-founder of Aiming for Healthy Families, Inc., and a member of American Christian Fiction Writers and Romance Writers of America. She lives in Mississippi. You can find out more at www.ptbradley.com. Revell, 352 pages. This book releases June 5. #partner #sponsored I received a complimentary egalley of this book from the publisher. My comments are an independent and honest review. Words are important. They are powerful. An essential question, then, is how does God want us to use words? The authors aim to help us reclaim the holiness of human speech. Most of the book is theological in nature. The authors explore the conversational ethics of the Bible. The book is more about developing a theology of of speech rather than providing practical ways to have our speech fulfill God's purposes. The authors look at topics of communicating in general like propaganda, advertising and marketing, connecting in the digital age, misinformation, etc. There were a few topics I found enlightening. One was tapping that “like” button on Facebook. Pretty soon the algorithm will show us only those kinds of posts we like. This confirmation bias reinforces our opinion, helping us to falsely assume we are right. (Loc 310/2163) It points out the larger problem of not seeing or appreciating other viewpoints. The authors lament, “...we are losing our ability to interact with diverse opinions and critically think.” (Loc 316/2163) We tend to stick with our own tribe and do not interact with people who have viewpoints differing from our own. The authors seem to go off on a tangent on occasion. For example, they have quite a lengthy section on how Christians treated Native American Indians. (Loc 782-809/2163) They also have a long section on church discipline. This book is a bit academic in nature as the authors quote from many sources. I think the book is geared more toward pastors and theological professionals rather than the general layperson. I do recommend this book to readers who are looking to explore the development of a theology of words and speech. Those looking to just redeem their own language may not find what they are looking for here. Ken Wytsma is the president of Kilns College where he teaches courses in philosophy and justice. He is the founder of The Justice Conference, a consultant and creative advisor to nonprofits and a sought after speaker on justice, church, and culture. A church planter and lead pastor at Antioch Church, he and his family live in Bend, Oregon. 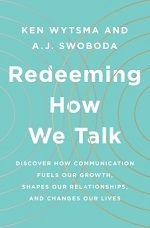 A. J. Swoboda is a professor, author, and pastor of Theophilus Church in Portland, Oregon. He teaches biblical studies, theology, and church history at George Fox Evangelical Seminary and Fuller Theological Seminary, among others. He previously served as a campus pastor at the University of Oregon. He is the author or co-author of several books. Moody Publishers, 224 pages. This book releases June 5. I enjoyed this Christian romance. It is a story of a contemporary romance that is tested by events in the past. Jillian, an obstetrician, and Riley, a relatively new Christian recently released from prison, have a budding romance. But they had met once before, during a wild college party. Unknown to Jillian, Riley is the father of the child resulting from that meeting, the child Jillian aborted. Riley is torn. He doesn't want to lie, but if he told her he was the father of her aborted child, she might hate him. Foster has crafted a good story of God redeeming past sins. Both Jillian and Riley have been transformed by God's grace. They are not the people they were ten years ago. An added element to the plot is a doctor who wants to marry Jillian. He is a hot shot and arrogant man. Riley is an ex-con with a compassionate heart. It is interesting to see how their characters are revealed. This is a good novel about God healing past hurts and about forgiveness. The characters are crafted well. You'll learn about the after effects of abortion and a little about ministry to teens. A good Christian romance dealing with several issues. June Foster is an award winning author and retired teacher with a BA in Education and MA in Counseling. She is the mother of two and grandmother of ten. She began writing Christian romance in 2010. You can find out more at http://junefoster.com/. This is the first book I've read by Caine and it certainly will not be the last. What an encouraging woman. Caine writes that she doesn't have five steps or seven keys to success. She just shares the process God walked her through, the same process she has seen God take others through too. (167) She shares stories from her own life and the lives of others. They are amazing stories of faith in the midst of adversity. She encourages us with the lessons she has learned from her experiences. They include the necessity of faith and patience. She challenges us to learn to walk with confidence as we face the unexpected. We will be a witness to others and cultivate an intimate relationship with God in the process. I highly recommend this book. It contains great encouragement to trust God with our pain and develop intimacy with Him. We can step out into the unexpected and unknown with unshakable confidence in God. Christine Caine is an Australian-born, Greek-blooded lover of Jesus, activist, author and international speaker. Her primary passion is to make Jesus' last command her first priority. Together with her husband, Nick, she founded the anti-human trafficking organization, The A21 Campaign. They also founded Propel Women, an organization designed to celebrate every woman's passion, purpose and potential. Some of her other books include Undaunted and Unstoppable. She and her husband live in southern California with their two daughters. You can find out more at http://christinecaine.com/index.php. Our American life is changing, Dickerson writes. The peace, tranquility, and culture our parents knew is crumbling. His goal in this book is to explain what is happening in the world and why, and help Christians understand how to live now. He believes Christians are the greatest hope for the nations. We might think that the greatest threat to our nation is from the outside. “In fact,” Dickerson says, “the most dangerous threat to the West is its own self-induced unraveling as it embraces the Post-Truth ideology and completes the final turn away from Christian influence.” (125) He explains the changes in ideologies, such as toward socialism and to post-truth thinking. He includes and explains five forces he feels are the major transformation factors. He looks at current trends and suggests what the future will probably be like. But Dickerson does not leave us hopeless. He suggests nine manifestos in response to the trends he identified. They are actions Christians can do today to prepare themselves and their families for the future. The suggestions are powerful and reflect living scriptural principles and trusting in Christ as ultimate victor. Dickerson provides video resources on each of these at https://hopeofthenations.net/. Dickerson is a bit verbose and repetitive. I felt I had to wade through his telling me what he was going to say, saying it, then reminding me what he said. The book could have been more concise and much shorter. I recommend this book. It is a good exploration of the current state of western civilization with great suggestions for Christians in living out their faith for today and the future. Zondervan, 320 pages. This book releases June 5. This novel is a gentle read, reflecting the general lifestyle of Amish people. Cameron offers a good romance with a bit of mystery included. While there is a slight twist to the plot, there are no surprises as readers are given plenty of hints along the way. I liked the characters. They are pretty well crafted. My favorite was Daniel, son of widowed Rose. He is a sweet boy with boundless energy. I liked Luke too. His love for Rose was so selfless and patient. I was not familiar with the meaning of the cardinal, the one that seemed to watch over Rose and Daniel. That the bird could somehow represent the presence of a loved one who had died seemed a little odd. I did learn some about other Amish ideas, however. I do recommend this novel to readers who like Amish romance. The end was abrupt and for me, unsatisfactory and just too easy. Other than that and the cardinal idea, a good novel. 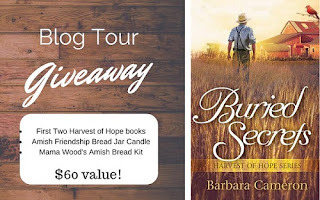 Barbara Cameron is the award winning author of many bestselling Amish novels. Three have been made into HBO/Cinemax movies. She has also written nonfiction books about planning financially for weddings. She is a former high school teacher and has also taught workshops and creative writing classes. She and her family live in Jacksonville, Florida. You can find out more at https://www.barbaracameron.com/. You could win books, an Amish friendship bread jar, and an Amish bread kit. I find it a bit hard to describe this book. It is sort of like a “walkabout through the majesty of God.” (202) De Leon helps us marvel at the work of God and out future. She motivates us to set our minds on spiritual things. So she helps us set our minds on things above, revealed to us by the Holy Spirit through the Word. I like her suggestion about meditation, to form mental pictures of what we read in the Word. De Leon teaches by story telling. She uses many examples from her own life as well as stories from the Bible. I recommend this book to women who desire to be “enthusiastic about our King and life with Him in the Age to Come.” (117) De Leon gives great motivation to find in the King all we desire. She helps readers know how to live day to day, representing the King. Her writing style is almost poetic and a delight to read. I found her topics a bit rambling but other than that, a good book for women. Kori De Leon is the founder of Adoring Christ Ministries, a teaching ministry devoted to reaching women through the local church, online resources, books, and speaking engagements. She graduated from Southwestern Baptist Theological Seminary with a master of arts in theology. She lives in Houston with her husband and their daughter. You can find out more at www.adoringchrist.org. I enjoyed this Christian romantic suspense novella. It was a good evening's entertainment. The plot moves along nicely and there is a good amount of character development for the novella's length. Part of that is because Samantha and Zack have a history. Samantha returned to the Cheyenne Indian Reservation in north Wyoming needing a break from her Washington, DC FBI duties. She had been violently attacked and the villain was still at large. The first person she met upon her return was her old flame, Zack, now the chief of police. An FBI agent on a break and a chief of police make a good duo for a suspenseful plot. They had been dating years ago when Samantha left. We readers hope the two can get beyond their hurt to rekindle their romance. Add to that a crazy killer hot on Samantha's heels and you have a good romantic suspense. I would have liked to have had Samantha's previous attack placed in a prologue. While the facts were revealed little by little, I think knowing about the attack right away would have heightened the suspense. This is a good novella for readers who like a quick and entertaining novella with a good deal of romance and suspense. Samantha and Zack are both Christians. That adds a good element of spiritual strength as well. Mary Alford was inspired to become a writer by reading captivating romantic suspense. She writes for Love Inspired Romance as well as Christian romance and sweet romance. You can find out more at http://maryalford.net/. Fitzpatrick looks at the story of Jesus and the two disciples on the way to Emmaus and concludes, “All of Moses' writings, the Psalms, and the Prophets were actually about him, his suffering, his glorification.” (Loc 1654/2159) She is quite clear that the Old Testament does not merely contain references to or truths about Jesus. She writes that Jesus was saying that “everything he read,” that is, the Old Testament, was about himself. (Loc 260/2159) Fitzpatrick also reminds readers that Jesus loves women, loves to instruct them. That really piqued my interest because there are some Old Testament passages that troubled me as a woman. There are OT passages that value women much below men. An example is Lev. 27:4 where the value for a man's vow is 50 shekels while a woman's is 30. Fitzpatrick had emphasized Jesus' love and honor for women so I was interested to see how these kinds of passage would be interpreted. But I was disappointed. Fitzpatrick picks the typical examples of Abraham, Hagar, Ruth, Esther, etc., that show gospel qualities. She doesn't choose a story like the unnamed woman in Judges 19 who died because of being abused by a mob, thanks to a Levite. Fitzpatrick went from assuring readers that ALL the Old Testament was about Jesus to picking out stories and passages that can be related to Jesus and His work. Rereading Luke 24:27 it seems to me that Jesus explained all the parts of the Old Testament that were about Himself, not ever claiming that the entire Old Testament was about Himself. I have mixed feelings about this study. I think Fitzpatrick makes way too many assumptions, like that Clopas' wife was Jesus' aunt. This is based on John 19:25 where Fitzpatrick concludes that the sister of Jesus' mother is the same as Clopas' wife. There was no punctuation in the original Greek but modern translators insert a comma, making them separate people. Fitzpatrick argues that Clopas and his wife were the two disciples on the way to Emmaus. We just don't know that. I would think this study would be best done in a group setting so these issues could be discussed and not just taken at face value. There are questions included for discussion or personal reflection. Elyse Fitzpatrick is a nationally known author and speaker. She holds a certificate in Biblical Counseling from CCEF, and an MA in counseling from Trinity Theological Seminary. She has authored twenty-three books on daily living and the Christian faith. You can find out more at https://www.elysefitzpatrick.com/. Bethany House Publishers, 160 pages.